Doremi started learning dance in kindergarten and has since developed diverse interests in a variety of dance styles. She obtained a Silver level certificate in International Latin during primary school, trained with her school dance teams throughout her teenage years competing in Chinese Classical and folk dances, tap and modern, and served as the captain of her high school dance team for three years. More recently at the 2016-2017 Overseas Taoli Cup Competition, she won a Gold award in the Midwest Regional with a solo Classical Chinese piece, and then another Gold in the World Final with a contemporary group piece. She now choreographs and dances with an audition-based contemporary dance group as well as multiple traditional Chinese dance groups at the University of Chicago, and actively attends classes and workshops in ballet, jazz, and ballroom. She joined Yin He in March 2017. When not dancing, Doremi enjoys petting her foster cat(s), doing research in immunology and translating all kinds of fun stuff between English and Chinese. Born and raised in Chicago, Hana grew up regularly taking dance lessons with Qiu Yue Jin. She later joined Yin He Dance Company as an apprentice dancer and was awarded the Ethnic & Folk Arts Master Apprentice Grant from the Illinois Arts Council Agency for an apprenticeship under Angela Tam. During her time as an apprentice, she was introduced to ballet and contemporary dance in addition to further refining her Chinese dance skills and technique. She participated in the 2018 Taoli Cup Midwest Regional competition with a solo piece, Ta Xue (踏雪) and placed into the platinum rank. 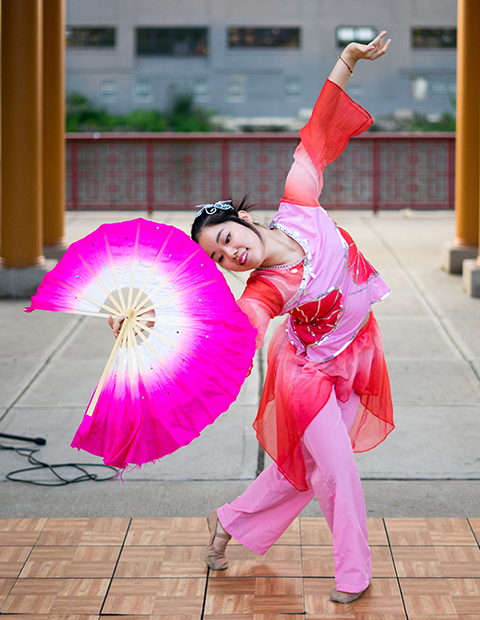 Amy, a founding member of Yin He Dance Company, began dancing as a child with Qiu Yue Jin. In her teens, she developed a strong interest for various Chinese dance styles, specifically Chinese classical dance. In addition to dancing, she is also a dance instructor who has taught in various schools and programs around the Chicago area. She has a bachelor’s degree in business management and is currently pursuing her Master’s in Accounting. Over the years, she has participated in several international and local competitions. At the 2017 Midwestern Regionsl Taoli Cup Competition, she placed gold for a duet and group dance and placed silver for a trio. At the 2012 Global Chinese Dance Competition in Shenzhen, China, she won Best Team Award for group dance Tao Yao. Judy Liu began dancing under Pao Ling Ling at five years old. She is currently a senior at Walter Payton College Prep where she is the president of the Chinese dance club. During the 2017/2018 school year, she led her club to a platinum ranking at the Tao Li Cup Midwestern Regionals. She participated in Yin He Dance's 2018 Summer Apprenticeship Program and is excited to join the company as an official apprentice this year. Kelly Liu was born and raised in Chicago. She started doing Chinese traditional dance at the age of 5, and further improved her dancing technique in modern, jazz, hip hop, and ballet at Whitney M. Young Magnet High School. She is currently a part of Whitney M. Young’s pre-professional dance company, Guys and Dolls. As a junior in high school, she will be continuing to improve her Chinese dance skills through her apprenticeship with the Yin He Dance Company. Sabrina Shih began training in traditional Chinese dance from the age of 8, under the instruction of Pao Ling Ling. She has been dancing for 10 years, training in ballet, pointe in addition to Chinese dance. Her education can be attributed to the Chicago Multicultural Dance Center, Joffrey Ballet, Academy of Dance Alliance, Intrigue Dance and Performing Arts Center, Chicago Dance Academy, and the Ling Ling Pao Dance Troupe. In addition, Sabrina has had the opportunity to perform in Chinese Fine Arts Society’s Chinese New Year at Navy Pier, Chinese New Year Party of Greater Chicago Unity (2016-2018), and the Great Chicago Fire Festival. Recently, Sabrina participated in the Tao Li Midwestern Regionals, winning platinum with her school Chinese dance group and is currently an instructor for the group. Sabrina was a part of Yin He’s Summer Apprentice Program and is thrilled to be continuing her Chinese dance adventures as a Yin He apprentice.